Are you looking to establish credibility online? Do you know how social media can help? How and what you communicate on social media can position you as a trusted resource in your industry. In this article I’ll show you how to effectively use social media to prove your place as an expert in your field. 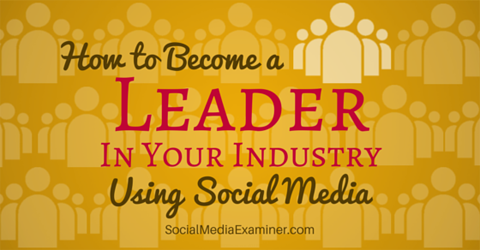 Find out how to become a leader in your industry using social media. The first steps to becoming a thought leader in your industry are deciding which social platforms fit your expertise and audience and then directing your efforts to those particular channels. While it’s a good idea to share your content on multiple channels, you don’t want to do so at the expense of reaching your main target audience. Marketo demonstrates this step well. They have a product that is highly specialized to marketers and business owners. In order to capture the attention of that professional audience, Marketo has to know where those people spend their time. In this case that social channel is LinkedIn—so that’s where Marketo spends most of their time sharing content. Marketo reaches marketers and business owners where they’re most active. By choosing the most valuable social channel for sharing and conversing, you’re getting more exposure, and likely more conversation; which in turn can lead to trust—one of the most basic components of becoming a thought leader. Many brands complain that social doesn’t work for them because they have nothing to post. The reality is, they’re probably right. If you aren’t busy doing, creating or finding relevant and interesting things to post about, social media will never work for your brand. If you want to be a thought leader, go ahead and put your thoughts out there—your success relies on publishing quality content (and sharing it elsewhere). Create shareable content to establish yourself as a trustworthy expert in your industry. In most instances blogging is in an important part of conveying expertise. Of course, different industries call for different types of content, so look at creating videos, case studies, whitepapers and infographics—whatever works for your audience. 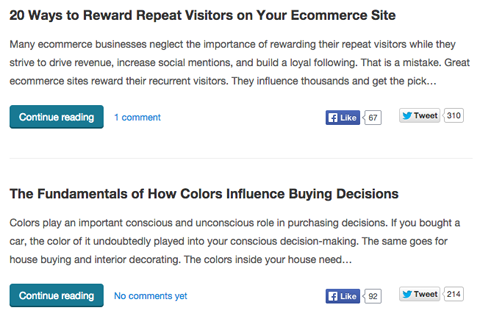 If you take a look at KISSmetrics’ blog, you’ll see that they put out relevant content, but it’s not flashy. KISSmetrics answers common marketing questions and concerns via blogging. Their posts are long-form and light on images. They include in-depth examples to illustrate their points and focus on answering their audience’s key concerns about marketing and business. Not everyone can have success with that model. You have to know your audience and cater to their needs. 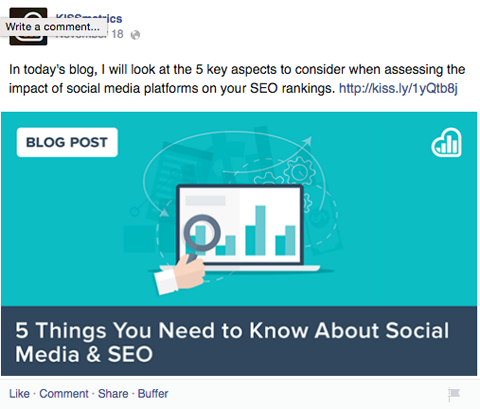 Since KISSmetrics’ audience is data-driven, the text-heavy posts work. You’ll obviously have a different experience if you’re in an industry that relies on visual content (e.g., design or lifestyle). It’s all relative, right? As noted in #1 above, the best place to share your content is on the network where your audience is most active. However, that doesn’t mean you should disregard the other social channels. You want to give your content the best chance at being seen. Don’t limit your sharing to one social channel. It’s OK to share similar content across social networks; just make sure you optimize for each platform’s expectations. Timing, visuals and copy all matter and should be tweaked for each social network. 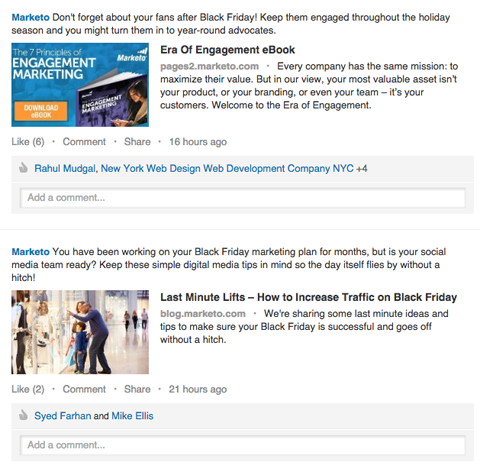 Before you start sharing, research best practices on each social platform. Even if you have the best content and a receptive audience, your shares will fall flat if they aren’t spread effectively. Your goal, of course, is to get people talking about your content once it’s shared. The most effective way to convince people of your knowledge isn’t broadcasting; it’s opening up a dialog about your subject of expertise and inviting those interested to join the back-and-forth. If you want them to continue to talk, you have to get in there yourself—be an active participant. Host a chat to increase your credibility as a reliable source of information. 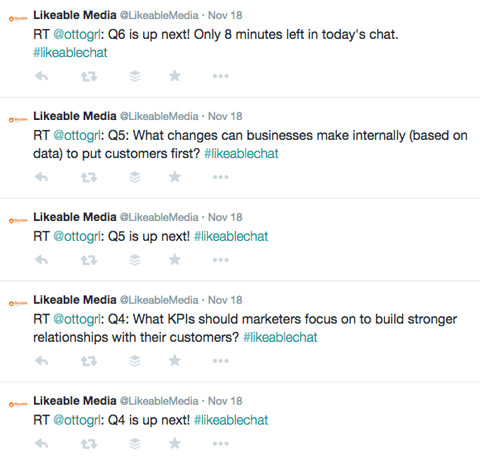 For instance, Likeable Media hosts a weekly Twitter chat called #LikeableChat and invites their audience to discuss marketing-related topics. Opening the gates to this kind of direct communication gives Likeable Media a forum to demonstrate their expertise, while simultaneously generating quality content for their target audience. The more your content is seen and shared, and the more conversation around it, the more likely you are to establish your company’s credibility and its role as an industry thought leader. Fashion retailer Zara famously built their brand by eschewing expensive marketing and simply building their stores next to high-end fashion retailers. The lesson here is that an association with the right brands (or individuals) is a valuable asset when it comes to establishing credibility. To gain that association, you need to actively collaborate with the people your audience views as influencers. 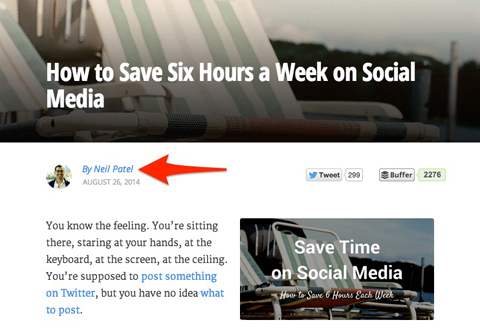 By inviting influential people to write articles for their blog, Buffer gets more visibility. 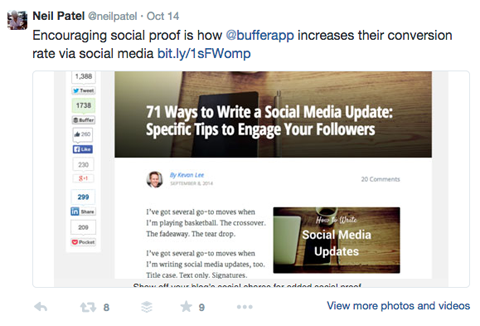 A successful example of this tactic is Buffer’s popular social media blog. Buffer frequently features guest articles from thought leaders in various industries they know their core audience is interested in. By inviting these influencers to work with them, Buffer is able to get free quality content and tap into the influencer’s established trust and credibility when those influencers share the content across their own social channels. 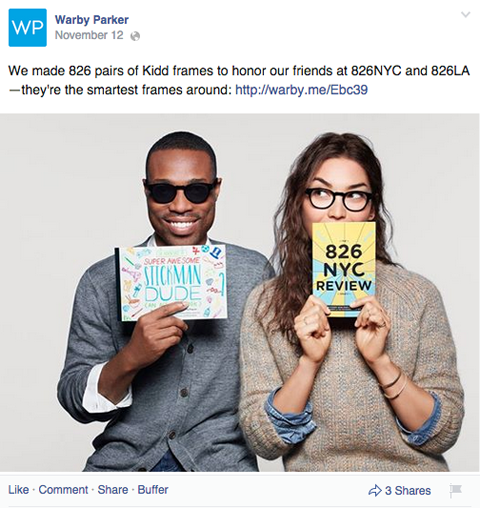 Working with influencers gives you more visibility on social media. Joining forces with other industry influencers not only has the benefit of associating your brand with established leaders, it can also spark lasting relationships that are mutually beneficial down the road. If you’re looking for a quick fix and rise to the top, I’m sorry to say that it’s not going to happen in a month or two. Building a lasting quality reputation through content marketing and social media takes consistent, concerted effort. It’s constant work to create quality content, share posts, align with existing influencers and keep up with conversations. But businesses that commit to this regimen reap massive rewards—and end up as industry thought leaders. What do you think? Have you used these tactics to gain influence? Do you have additional advice for others? Share with us in the comments below.